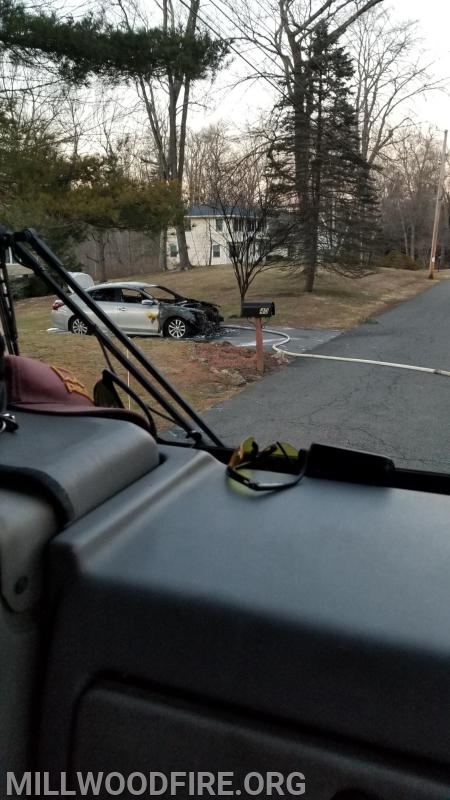 Just before 5pm yesterday evening, Millwood FD was dispatched to a reported motor vehicle fire on Edgewood Rd. Car 2255 (1st Lt. Horan) was first to arrived in Utility 145 and confirmed the working motor vehicle fire. Engine 247 arrived on scene and stretched the first hand line to begin extinguishing the fire. Engine 248 arrived soon after and secured the hydrant across the street in case more water was needed. After extinguishing the fire, members checked nearby utility poles for heat but found no need to contact Con Ed. Units were back in service within an hour.